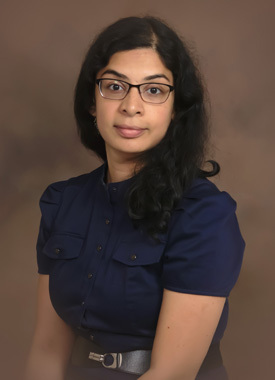 Janani Rangaswami went to medical school at the MGR Medical University, India, followed by her residency and chief residency in Internal Medicine at Einstein Medical Center, Philadelphia. After completion of her nephrology fellowship at Weill Cornell Medical Center, NY she developed a strong interest in the overlap area of Cardio-Nephrology, pertaining to optimizing cardiac care of patients with chronic kidney disease and kidney transplantation. Her current research studies include studying platelet reactivity and its variability with hemodialysis and the effects of statins in erythropoietin dosing in dialysis patients. She is also editing a textbook on the scope of Cardio-Nephrology, alongside Drs. Edgar Lerma and Claudio Ronco. She serves as Associate Program Director of the medicine residency program at Einstein Medical Center, and maintains an active interest in graduate medical education. Outside medicine, she is a professionally trained vocalist in South Indian classical music and actively practices and performs in this area. » Go back to all Del Val Nephrology Physicians.